Jubelale hits the shelves for the 25th year this October. Deschutes Brewery is now covering 16 US states, so those of us lucky enough to get this will see it in bottles and on draft through December. As for my part in the image above, I tried to make an actual hot summer day feel a bit more like Fall. The release of Jubelale always reminds me that we're entering one of my favorite seasons, when the days get shorter and the rain begins. However, yesterday screamed Summer with bright sunshine and temperatures in the 70s, so I had to fake it a little. I waited until after sunset and threw a little water onto the shadowy bottles to create my own miniature Fall at the beginning of September. I don't want to give everything away, so you'll have to check out the fully illuminated label when you pick up your 6 or 12 packs in October. For the past 25 years, beer fanatics have made their holiday seasons complete by enjoying a spicy, malty, hoppy bottle of the Deschutes Brewery’s winter seasonal, Jubelale. Almost as anticipated as the beer itself is the beautiful labeling and packaging artwork, which features the creations of a different local artist each year. That’s why, in a majestic nod to the past, the 2012 label artwork is a grand amalgamation of 25 years of art. The 2012 label is literally “layered” with meaning–the artwork was created through a complex collaging process by Bend, Oregon artist Kaycee Anseth Townsend. She uses small scraps of paper to create designs, and she comprised the 2012 packaging entirely from pieces of Jubelale labels from years past. Fans may even be able to see a recognizable scrap or two from years gone by inside the incredibly intricate final design. 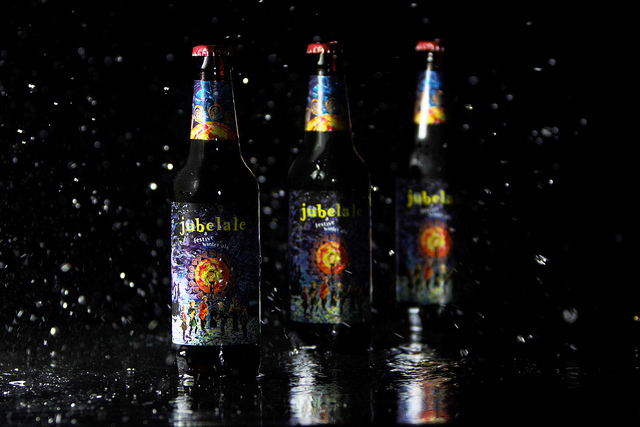 Jubelale was the very first beer to ever be bottled by the brewery, and it epitomizes the season with a big - and a welcome - warming alcohol temperament. A new regional artist is commissioned every year to create an original work of art, inspired by Jubelale, to be transformed into label and packaging art.